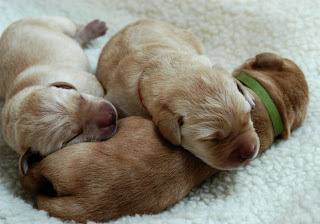 Take a first look at some of the Gemstones puppies! They're due to be born around the Fourth of July. Help Us Name Pearl's Puppies! 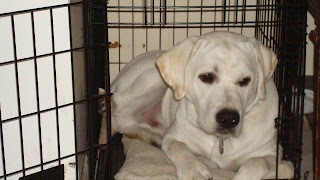 SSD Pearl is going to have puppies soon! 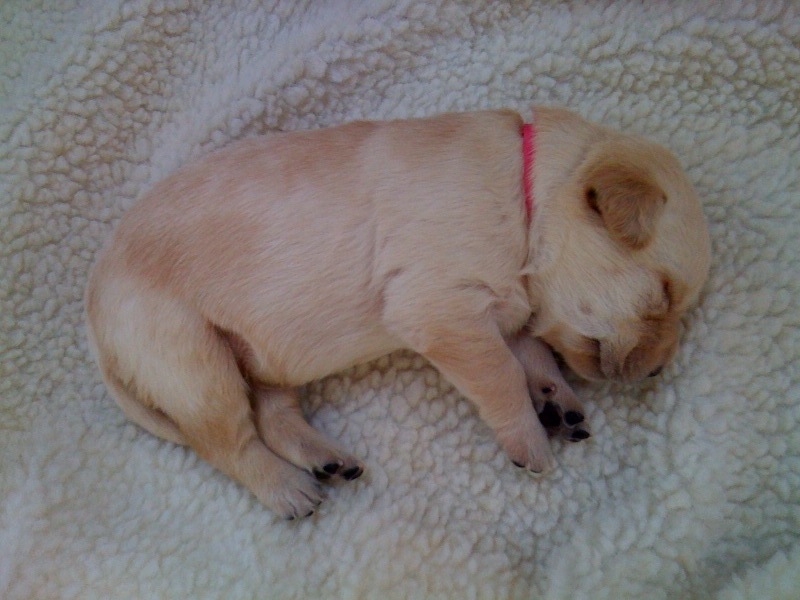 She went for her ultrasound at the Palmyra Animal Clinic in early June, and the vet saw 6 or 7 puppies! 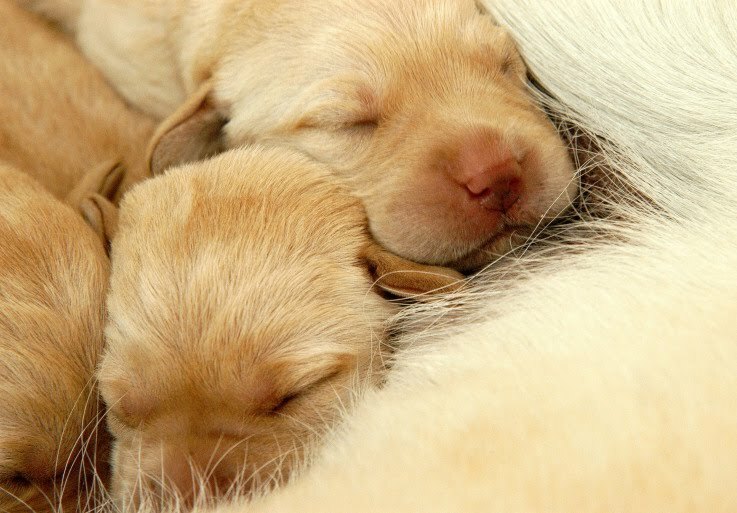 We won't know the exact number of puppies until they're actually born. It's possible that some puppies were camera-shy and were hiding behind their brothers and sisters during the ultrasound. You can definitely tell that Pearl is pregnant. And she keeps getting bigger! She's due to give birth around the Fourth of July. 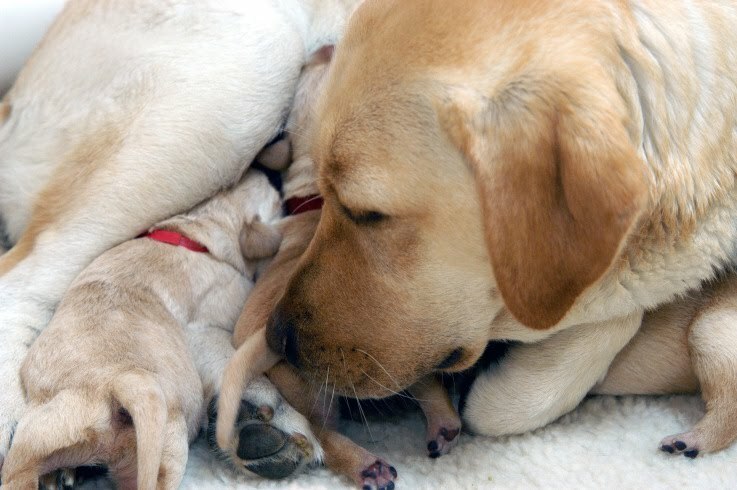 Pearl's breeder caretakers have chosen a fitting theme for Pearl's puppies. They're going to be "Gemstones!" Just like we did with Midge's puppies (Dylan, Zappa, Hendrix, Grace and Jagger), we would like your help to name Pearl's Gemstones. Pearl's breeder caretakers will then use your suggestions when they choose the puppies' names. All of the names must have something to do with gemstones. You may suggest as many names as you would like. Make sure you list both male and female names. 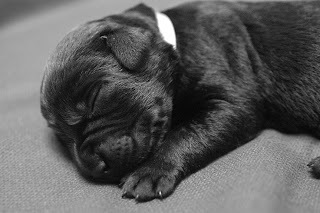 We'll announce the puppies' names when they're born, around July 4. Just leave your puppy names in the comments! Join Us for Dinner with the Dogs! Would you like to have dinner with the dogs? Join us at La Piazza on June 30 from 5:30-7:00 p.m. and meet some of the dogs you've been reading about! A few weeks ago, we learned that Wednesday, June 30 is the unofficial Social Media Day, and we thought it would be a wonderful opportunity to meet our online readers, fans and followers! We're holding a meetup at La Piazza, a restaurant in Harrisburg. We would love to meet you! You'll be able to meet our staff, our wonderful volunteers, and of course, the dogs. This is a great opportunity to see the dogs in action as they practice becoming invisible in the restaurant. Plus, La Piazza serves delicious food! We've eaten there before with the dogs-in-training. Please RSVP so we know approximately how many people to expect. We're unable to provide food for everyone, but we do want to make sure we have enough tables. RSVP if you're coming to the event! Don't worry if you forget to RSVP. You can just show up at the restaurant! Service dogs are always welcome, but please leave your pets at home. We hope you'll join us! We're looking forward to meeting you! 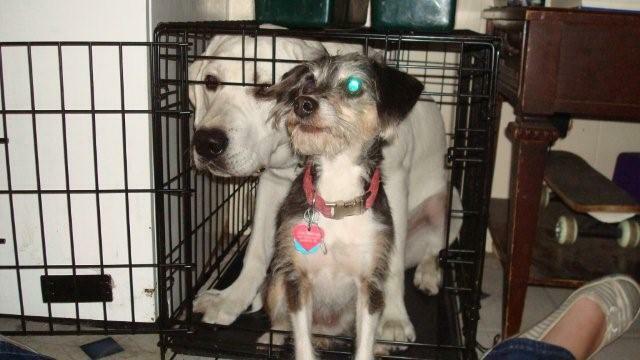 Even though Nubble is over 70 pounds, he still likes to squeeze into Gizzy's crate, sometimes while Gizzy is inside! He just lays down and curls himself into a little (well, big) ball. He has his own, much larger crate, but he seems to like the smaller one. His puppy raisers took him to Cabela's, a huge hunting, fishing and outdoors outfitter. It was a good outing, although Nubble was pretty excited. Not only was there his normal excitement at being on an outing, but a thunderstorm was brewing and it was extremely windy outside. The Cabela's decor includes real stuffed animals, and Donna was sure that Nubble would have a hard time around the animals. But he surprised her. He behaved his best around the animals! He did bark twice at some of the deer, but that was it. The store was full of people, and Nubble was very attentive to Donna. They practiced up and all the way up on the benches in front of the fish tanks. However, they didn't stay there very long. Nubble loves to swim, and they thought he might want to jump in with the fish! In puppy class, the Northeast Division has been working on shaping. Meg, the SSD coordinator in the Northeast, brought in a collapsible tunnel, and Donna worked with Nubble to shape him to go through it. Shaping is a learning process for both the puppy raiser and the dog, and Donna and Nubble are starting to get the hang of working together to shape a behavior. By the end of the session in puppy class, Nubble was putting his head into the tunnel! Nubble always lets Donna know when he needs a break from a training session. He simply lays down and that's it! Nubble and his puppy raisers had their puppy evaluation. It went well. "I was happy with the progress," says Donna. Nubble is on his way! Floating beach balls, earthquakes and hurricane force winds, giant sneezing clowns - our new service dog teams in training encountered all of these things yesterday. Where were they? The Whitaker Center for Science and the Arts! The Whitaker Center is a wonderful outing for the teams in training because not only do the teams get to practice in a challenging environment, but it's a lot of fun, too! Each team paired up with an experienced trainer or volunteer and worked their way through all three levels of the Whitaker Center's Science Center. The Science Center is full of things that could potentially be very distracting or even scary for the dogs. For example, as soon as you walk into the Science Center from the information desk, there's a display where you can push a button and a stream of air will shoot up to make a beach ball float in the air. The dogs did very well at this display. They were curious about the floating ball but not so curious that they didn't respond to their partners. Other areas gave the teams opportunities to practice other skills. SSD Snow practiced pushing buttons, Aladdin did under at the Legos table, Bella practiced take it to pick up a dropped Lego block, Sonora did up on the slide and Aurora showed off leave it at the wiffle balls spinning in a giant funnel. Watch a video of the teams at the Whitaker Center. Thank you to the Whitaker Center for donating the tickets for our service dog teams! These puppies love their food! Dylan, Zappa, Hendrix, Grace and Jagger ate their first real meal today. Their breeder caretaker softened puppy food in warm water and then blended it in a blender until it had the consistency of gruel. Diane put three plates of this puppy gruel in the whelping box and as soon as she placed the puppies in front of the food, they dove right in! Sometimes puppies aren't quite sure what they're supposed to do with this new food, since they've been used to nursing for all of their lives, but the Rock and Roll Stars knew exactly what to do. Each week we add something new to the whelping box to give the puppies new experiences and lots of sensory exposure. Last week, we added new surfaces for them to walk on. This week we added new toys and a crate. 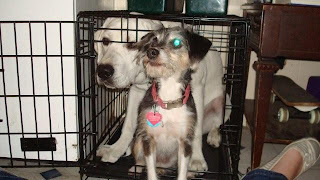 Most of the puppies have no problem with the crate. They walk in there on their own and curl up for a nap. Jagger seems to prefer sleeping behind the crate, though, rather than in it. We also added a line of water bottles along one side of the whelping box. We got the idea from the breeder caretakers of Midge's mother, Stella. They had tied pine cones to the side of the box, and the pups loved them! They would rub against them like they were scratching. We didn't have pine cones, but the water bottles serve the same purpose. 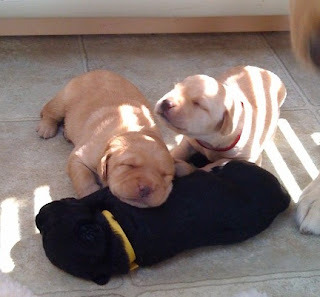 As soon as Diane tied them to the box, the puppies came over to investigate and play with them. 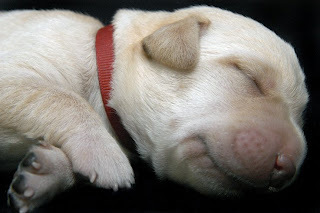 Keep watching the Puppy Cam to see what the Rock and Roll pups will do next! Today was the ninth day of Team Training. Three more days of training and then our new service dog teams take the public access test! We went to the Colonial Park Mall so the teams could practice out in public. Each team worked on loose leash walking, basic obedience, greetings (having someone pet the and using the elevator (getting on and off the elevator so both the service dog and partner are safe), as well as any specially trained skills. Everyone did a great job! We can definitely see the partners and dogs bonding! Watch a video of the teams at the mall. It was pouring rain yesterday, but that didn't stop us from visiting the zoo! Our service dogs-in-training went to Zoo America in Hershey for a puppy outing. What great experience for the dogs! Although it was a challenging outing, the dogs and puppy raisers did a great job. Practice started even before we walked through the doors of the zoo. The dogs practiced loose leash walking on the path leading to the doors. Here's a video of SSD Hawk and his puppy raiser working their way along the path. In loose leash walking, the dog must walk next to his handler so that the leash is nice and loose. In this video, notice how as soon as Hawk starts to pull, his handler stops, backs up and turns around to get Hawk refocused and walking on a loose leash. In this video, SSD Misty walks nicely along the wooden walkway near some of the animal cages. To keep her walking on a loose leash, her handler is clicking and treating every few steps. A high rate of clicks and reinforcement makes sure that Misty's attention stays on her puppy raiser and that she continues loose-leash walking without getting distracted by the interesting smells and animals. The zoo animals were often as aware of the dogs as the dogs were aware of them. We wanted this to be a fun and safe trip for everyone - dogs, puppy raises and zoo animals - so not only did we watch the dogs' reactions to the animals, but we also watched the animals' reactions to the dogs. If the dogs got too agitated and started barking, we removed them from that area immediately. Likewise, if the zoo animals were getting too agitated, we removed the dogs, even if the dogs seemed calm. In this video, you can see that the elk is very aware and interested in SSD Journey. The elk stands very still and stares at her. Journey is also aware of the elk, but notice how she is still focused on her puppy raiser. She keeps making eye contact with her puppy raiser, and when she's given the cue up, she reacts right away to put her feet on the fence. The presence of the elk does not distract her to the point where she does not pay attention to her puppy raiser. The wolves were the biggest challenge for the dogs. As soon as the wolves noticed the dogs, they began pacing along the fence, and many of the dogs wanted to go right up to that fence. This was a great opportunity for puppy raisers to use power treats (treat the dogs love, which are only used for challenging situations) and keep the dogs' attention on them. We kept visits to the wolves very short for the well being of both the dogs and wolves. In the video, notice how SSD Tundra stands right by the fence to watch the wolves, but when her puppy raiser asks for her attention, she gives it to them. Overall, our trip to Zoo America was a success! Great job, everyone! Today is Day 5 of Team Training and each of the new service dog teams have made amazing progress! We can see the bonds forming and getting stronger each day. There are seven teams in Team Training - SSD Aladdin, Aurora, Bella, Cinderella, Kiara, Snow White and Sonora. This morning, we set up stations throughout the room. At each station, the teams worked on a different behavior. SSD Aladdin finds and retrieves the phone. SSD Kiara practices lap. She rests her front legs in her handler's lap. SSD Cinderella stays and then comes nicely when her partner calls her. 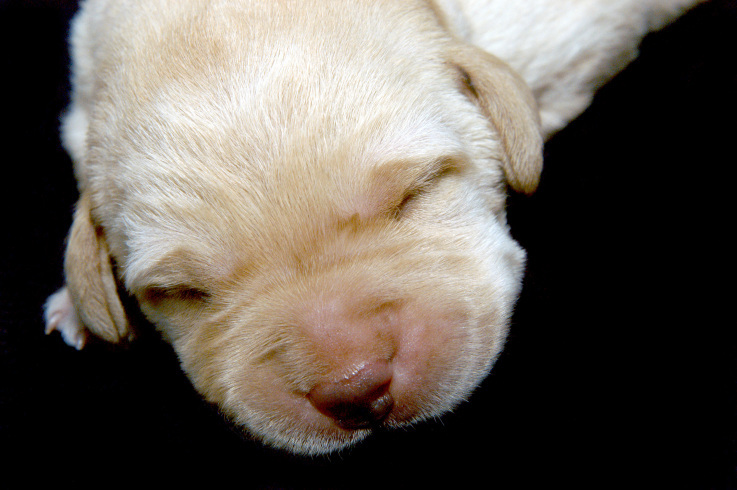 The Puppy Cam is here! We welcome Dylan, Zappa, Hendrix, Grace and Jagger to the stage. If you're wondering which puppy is which, Dylan has the orange polka dot collar, Zappa is in burgundy, Hendrix is lime green, Grace is pink (of course!) and Jagger is yellow. You'll easily be able to pick out Jagger - he's the only black lab in the litter! We had a few technical difficulties when we were setting up the puppy cam today, so the Rock and Roll Stars puppies will have to wait a little longer to make their big debut. 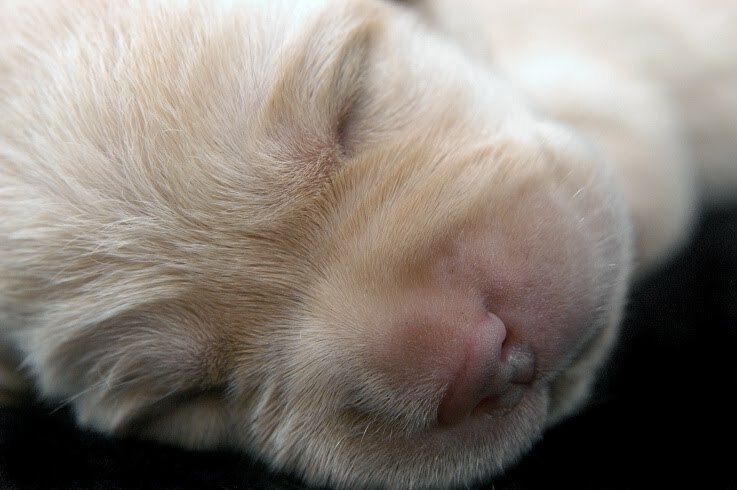 But even though the puppy cam won't be up today, we do have some videos of the puppies to share with you. Hungry puppies nurse. Midge is such a great mom! Zappa wobbles around the whelping box. The Puppy Cam Is Coming Tomorrow! Tomorrow the Rock and Roll Stars puppies take the stage live for the first time. You'll be able to watch Dylan, Zappa, Hendrix, Grace and Jagger on our online puppy cam. We'll post the website tomorrow! 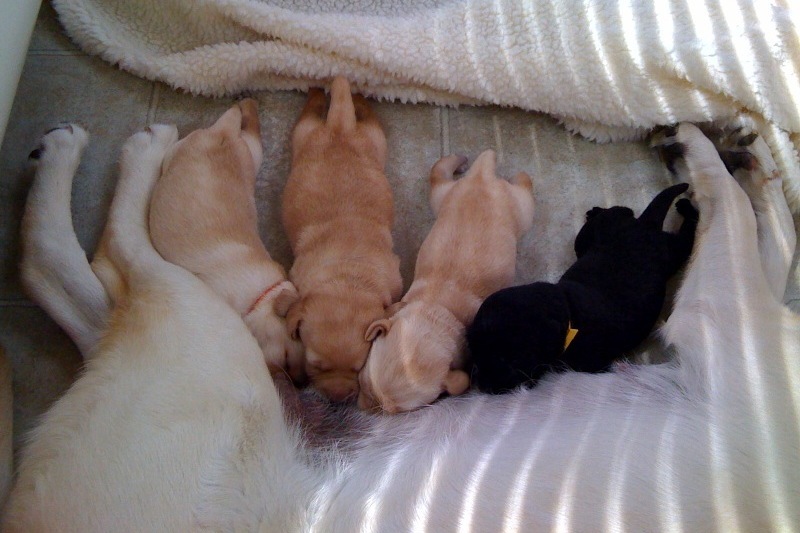 The pups are one and a half weeks old today, and wow, are they growing fast! Here are some photos of the puppies at one week. Nubble went to a Memorial Day parade, too. He loved to watch the flags and fire trucks. He was very well behaved, except when other dogs were around. If there are other dogs around, he will practically pull his puppy raisers off their feet in his eagerness to greet the dogs. He is starting to improve, though. Donna, one of his puppy raisers, says that he is making progress. "I see him making decisions," she says. "I see him looking at butterflies and then deciding to look at me instead. I see him looking at Baby the Cat and then deciding not to chase her. He's definitely maturing." He still sometimes gives in to the temptation to chase the cat, butterflies, bugs - anything - and when he does, he bolts. Donna has learned to be very attentive because Nubble is getting stronger (almost 70 pounds!). He could be walking perfectly on a loose leash and then suddenly bolt. But it no longer happens every time he sees something interesting. Nubble is finally catching on to go on through! Donna can walk in and out of her bedroom or the front door without Nubble trying to bolt through the doorway. Progress! Donna has also been working on visit with him. 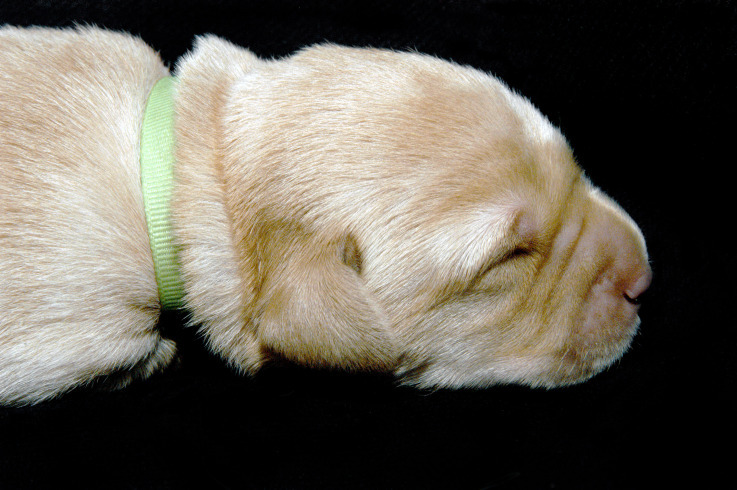 Visit cues the dog to put his head in a person's hand or in their lap. Nubble was a little confused about what Donna wanted him to do, but she kept working at it. By timing her clicks, she managed to capture the behavior she wanted, and now Nubble seems to understand what he's supposed to do. They're continuing to shape the behavior. Donna took Nubble to the farm, where they worked on greeting horses. Nubble has no fear of them. It's almost as if he thinks they're just big puppies. 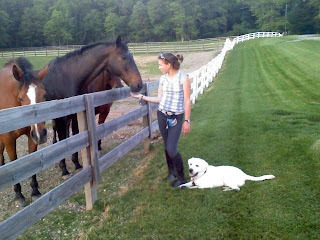 Donna is working on teaching him that the horses aren't animals to play with. If you've been following the posts about Nubble, you know that he has a lot of difficulty with stairs. He may have had a breakthrough! Donna took him to Boscov's again to practice stairs, and he was doing very well. Donna may have figured out why he was having such a hard time with stairs. While they were at Boscov's, she noticed that those stairs were textured to prevent people from slipping. Most of the other stairs they've been practicing on haven't had texture. Donna believes that if Nubble thinks he's going to slip, he won't go up or down the stairs. Since then, they've been practicing on the Boscov's stairs, and Nubble has gotten better. The Northeast Division held a puppy outing. They did a public bus ride, which is great experience for the dogs. It was a successful trip for Nubble! Because of traffic, Donna and Nubble got to the bus stop just before the bus was leaving. Even though he had just been in a car for an hour and a half, he got on the bus and settled right away. He did great on the bus ride despite the close quarters, other dogs and the bus itself - lots of distractions! At the end of the bus ride, Nubble and the other dogs walked around the city square. Nubble did very well with the traffic, crowds, construction, big trucks and trash. It was great exposure to all sorts of experiences. On the bus ride back, he did well. For fun, Nubble loves to go swimming! Not only is it great exercise for him, but it cools him off, too. He loves it so much that Donna has to make him relax because he would just keep jumping in the water! Nubble went canoeing! Donna and her family took their canoe to Blue Marsh Lake. While Zac and Lindsey held on to the canoe, Nubble climbed in with Donna. Once he was inside, Zac and Lindsey walked with the canoe into waist-deep water. Nubble kept going from side to side looking at the water and trying to get his sea legs! Donna thought she would be tipped into the lake for sure! They managed to get Nubble to sit a few times, giving him lots of treats when he did. As soon as Zac and Lindsey walked the canoe closer to shore, Nubble jumped into the water! It will be a little while until they take him out into deeper water, but they're going to work up to it. Thunderstorms? No problem for Nubble. There have been quite a few storms lately in Nubble's area, but they don't seem to bother him. He just lays at Donna's feet. Yes, Nubble is making progress! Memorial Day is a wonderful time to honor all of our veterans, and many of us celebrated by going to a parade. That's exactly what our service dogs-in-training did! Three of our dogs-in-training (SSD Sunshine, Teddy and Rio) and one of our breeding dogs (SSD Fire) marched in the Camp Hill Memorial Day Parade. It was a beautiful day, and we all had a lot of fun, even though it was hot. The parade offers a lot of training opportunities because of the excitement, noise, crowds, costumes and candy. We spent the first part of the parade on the sidelines. The dogs got to watch clowns, a mascot and a bunch of little yellow cars zip around the road. They quickly got used to the cars. The mascot, however, was a little more challenging. Some of the dogs started barking at it, and their handlers moved them away from the sidelines to calm them down. SSD Sunshine wasn't too keen on getting close to the mascot, which looked like a giant badger, but her handler worked with her until she was able to walk right next to the mascot without a problem. To do that, Sunshine's handler kept walking her past the badger, clicking and treating every time Sunshine ignored the badger. Each time they walked past, they moved closer to the badger until they were walking right next to it. Nice job! Soon it was our turn to join the parade. SSD Sunshine, Teddy, Rio and Fire marched past hundreds of people. It was a great opportunity to practice loose leash walking and self control. As the dogs walked past the crowds, many people petted them. (In this situation, it was okay that people just reached out and petted the dogs. Normally, if you see a service dog, especially a service dog wearing a harness, you should not pet it.) But even though the dogs were getting lots of attention from other people, they still needed to stay focused on their handlers. The dogs also got lots of leave it practice. There was so much candy in the street! The dogs did great at ignoring the candy. It was a very successful outing for the dogs! Teddy, Rio, Sunshine and Fire aren't the only dogs that went to a Memorial Day parade. Many of our puppy raisers took their dogs-in-training to parades closer to their homes. We hope they all had a fun experience!